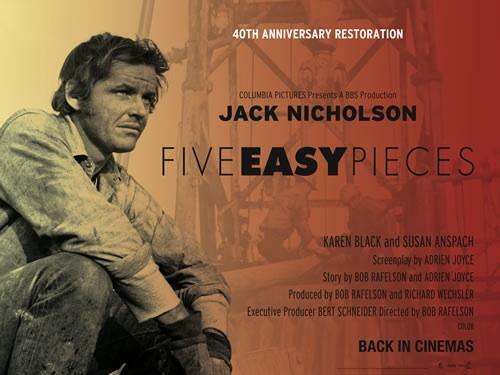 One of the jewels of the so called American New Wave - a rich period in early 1970s American cinema - Five Easy Pieces comes from BBS Productions, the same stable as Easy Rider and The Last Picture Show. It tells the story of Bobby Dupea (Jack Nicholson) an oil worker who is hiding from his past as a classical pianist and member of an elite musical family. When he learns that she is pregnant Bobby takes to the road with his girlfriend Rayette (Karen Black) and goes to visit his sister Partita in Los Angeles. From there they continue to see his ailing father at the family home in Washington State, having a series of adventures and encounters along the way. The film's co-writer and director is Bob Rafelson, who made his name as one of the creators of the ground-breaking tv show The Monkees in the 1960s. This is Rafelson's most celebrated film and for Jack Nicholson it was a career defining role. His portrayal of Bobby is unforgettable - most notably in the hilarious roadside restaurant scene where he is determined to order a dish that is not on the menu. The supporting cast, particularly Karen Black, is superb and the movie is beautifully and poetically shot by Laszlo Kovacs. Five Easy Pieces was made in the same year as our last film club presentation The Go-Between - the contrast could not be greater.